If you love Laura Blythman's whimsical collage-style artwork, you'll be just as thrilled as I was to discover Laura's collaboration with the Little Renegade Company. What results are super-cool caps, duffle bags and backpacks for kids in the Moonscape and Sugar Mountains prints. The caps feature leather peaks and three different sizes for little heads, the duffle bags have leather sides and the mini and maxi-size backpacks have a leather front pocket. These are pieces are functional and stylish with a touch of luxury. Perfect for back-to-school (for those lucky enough to be able to take their own bags), and great for sleep-overs and summer holiday adventures. The tricky part will be choosing just one print! 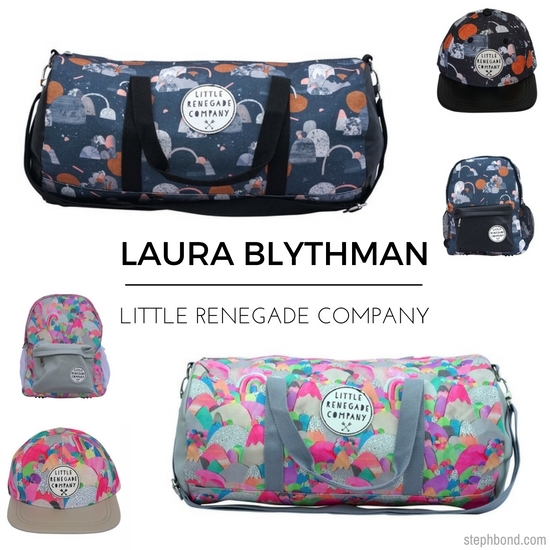 You can find the Laura Blythman designs in the Little Renegade Company online store and can be shipped around Australia and internationally. Thank you so much for this mention we love Laura's designs and hope to work with there in the future.